In their video installations, the collaborative team of Gulnara Kasmalieva and Muratbek Djumaliev use the emotional energy of popular music to calculated effect. Songs with ready-made emotive value lend meaning to otherwise straightforward pictures of labour, leisure, protest and national identity. Culling imagery from travels through their homeland – the former Soviet Central Asian republic of Kyrgyzstan – the artists offer a rare glimpse into the political and economic realities of their world. However, the musical accompaniment, along with other editing processes such as montage, undercut a fact-based or judgement-free presentation. Without irony or apparent critical subtext, these videos are characterized by a con-sistent tone of matter-of-fact sincerity. Realism is thus the first step towards regaining a foothold after the Soviet pullout and, as such, survives because it is so easily internalized and adapted to the new political cause; stylized realism may just as easily connote Socialist Realism. Recently The Art Institute of Chicago commissioned Kasmalieva and Djumaliev to create a work specifically about the economy and culture of the Silk Road, the ancient trade route that connects East and West. Also included in the exhibition is one of their better-known works, Trans-Siberian Amazons (2004), which appeared in the first Central Asia pavilion at the 2005 Venice Biennale. This work has been streamlined into a three-channel video installation. Not content with simply providing tourist snapshots or documentary footage, Kasmalieva and Djumaliev employ various filmic techniques in a subtle way to produce an artful vision of the real. The artists create Social Realist music videos that incorporate melodies either found along the journey or else taken from the songbook of the popular imagination. on a caravan of long-haul tractor-trailers transporting rusty scrap metal to the industrial giant to the east in exchange for cheaply made clothing. This rattletrap cargo constitutes the remaining ruins of the former Soviet empire being literally and metaphorically stripped clean, carted off and exchanged for a free-market way of life. Halfway through the video we encounter a Kyrgyz man playing accordion and singing a traditional folksong. With the introduction of the music, the concerns of the caravan segue to rural activities such as ball games, casual conversation and horseback riding in the remote terrain near the border. It isn’t necessary to know that the folk song is a nostalgic paean to the surrounding mountains; even if the lyrics are indecipherable to Western ears, the emotional cues are clear. As music and image converge seamlessly, a humble and sympathetic portrait of the Kyrgyz people emerges. But the format of A New Silk Road is familiarly stylized – it’s basically a highbrow fluffy promotional video. Common to tourism committees and venture capitalists (and far-flung biennial boosters), the promotional video solicits enthusiasm and sympathy in the name of information dissemination. Kasmalieva and Djumaliev are fond of this particular format. In 2005 they documented Kyrgyzstan’s Tulip Revolution, which violently ousted the country’s corrupt leaders. Using Edvard Grieg’s well-worn ‘Hall of the Mountain King’ (1876) as a structuring device, the edited action swells and climaxes only within the parameters set by the music. Grieg’s classic (written for Henrik Ibsen’s Peer Gynt) demands the consistent satisfaction of expectations. To borrow this effect for the video is to deny a viewer’s dissent. A New Silk Road works us over in the same way; traditional folk music justifies, and patches over the messier and arguably more interesting realities glimpsed at the edges of the frame. Such sincerity might be described in some circles as kitsch, in others as a compassionate portrait of humanity. 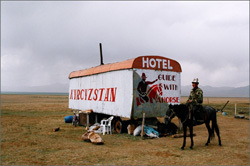 As a mode of activism, A New Silk Road only goes as far as increasing our awareness of contemporary Kyrgyzstan. Or perhaps it enacts an unhealthy memory, a bit of feel-good Agit-prop scar in Kyrgyzstan’s collective Soviet-era psyche. If, however, Kasmalieva and Djumaliev are taking a critical stance towards their country’s inability to thwart the determined machinations of globalization, then their methods may be too subtle and safe to register such unease. If they are genuinely interested in glorious representations of the rural folk and the working class, they’ve travelled this road before, and an artist’s idealism, no matter how heartfelt, is no guarantee of a viewer’s empathy.